Piqua’s Kameron Darner (2) and Iverson Ventura (22) battle for a loose ball against Tecumseh’s Brandon Berner Saturday at Garbry Gymnasium. Piqua’s Mick Karn drives to the basket against Tecumseh’s Donovan Collins Saturday at Garbry Gymnasium. Piqua’s Garrett Schrubb puts up a shot against Tecumseh’s Randy Collins Jr. Saturday at Garbry Gymnasium. The Tecumseh Arrows may have brought a 2-15 record into Garbry Gymnasium Saturday night. But, for one half, they looked like a different team. 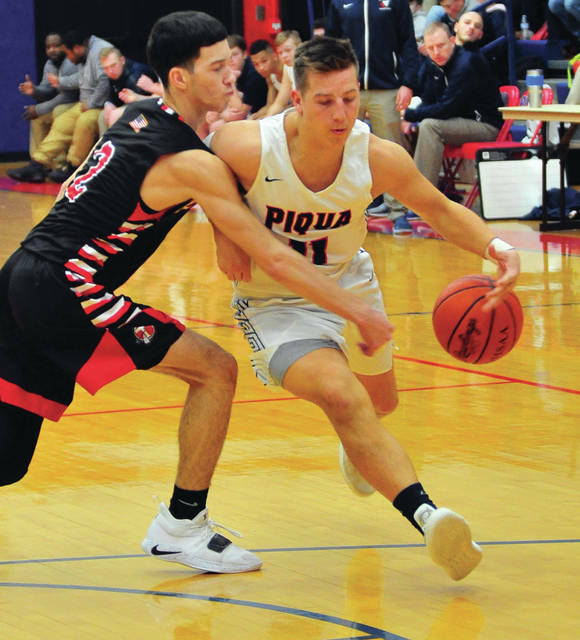 And that was just enough to stun Piqua 69-67 in non-conference action. While Tecumseh improved to 3-15, the Indians dropped to 6-12. The Indians return to action Tuesday when they travel to Fairborn for a girls/boys doubleheader before the “Purple Out” with Sidney Friday at Garbry Gymnasium. Tecumseh lit the nets up with 42 first half points, including nine 3-point field goals on 14 of 26 shooting. Easton Lewis led the way with 25 points in the opening half, which including hitting six of seven 3-point attempts. That led to a 42-26 Arrow lead. Piqua responded by holding Tecumseh to six field goals in the second half, but could never quite catch up. The Arrows had led 20-16 after one quarter, before going up by 16 at the break with a 22-10 advantage in the second quarter. 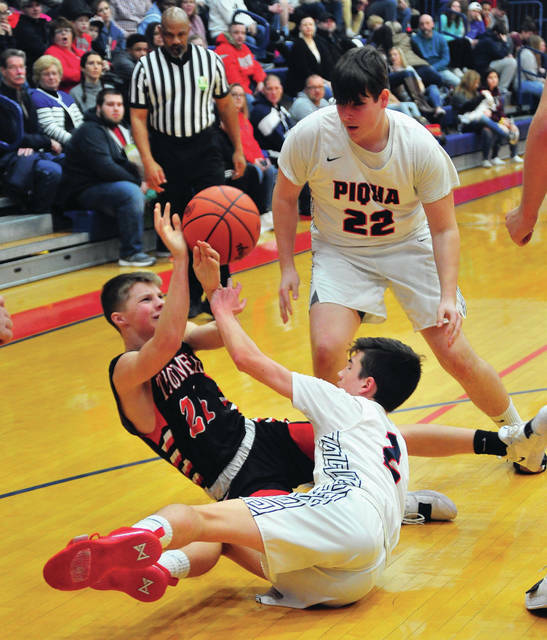 While Piqua held Tecumseh to 11 points in the third quarter, the Indians could not gain any ground — scoring only 11 points themselves. Tecumseh still led 59-45 with under five minutes to go in the game, before Piqua finally got going. Using full-court defensive pressure to force turnovers, Piqua scored six quick points. Baskets by Kameron Darner, Garrett Schrubb and Mick Karn cut the deficit to 59-51 and led to a Tecumseh timeout with 2:53 remaining. Tecumseh took the lead back up to 12, before a Karn basket with 2:38 remaining. Darner was fouled shooting a three with 2:00 to go and made all three free throws to get Piqua within 63-56. Tecumseh, who made just two field goals in the fourth quarter, but was 12-for-18 from the line, got one free throw from Donovan Collins and two from Lewis to make it 66-56 with 1:19 to go. Trey Richmond had three baskets for Piqua to get the Indians within 67-62 with 22.9 seconds to go. After two free throws by Davey Berner, Qurri Tucker scored to make it 69-64 before Schrubb hit a three at the buzzer for the final score of 69-67. 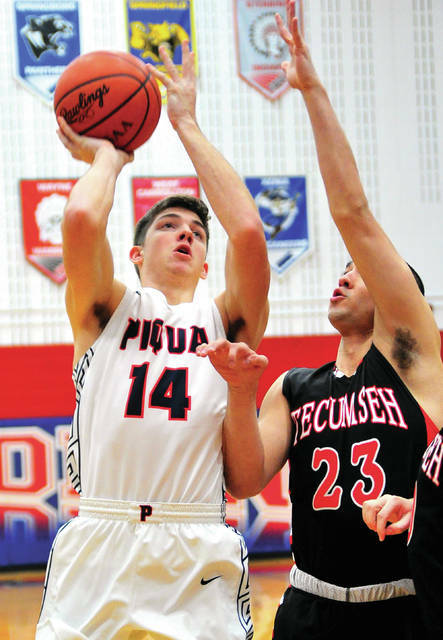 Mick Karn led Piqua with 19 points, while Richmond had 14 points and seven rebounds. Tucker had 12 points, Schrubb added 10 and Darner scored seven. Lewis, who did not make a field goal in the second half, finished with 33 points and seven rebounds for the Arrows. Seth Hale scored nine points, Randy Collins netted eight and Donovan Collins and Davey Berner both finished with seven. Piqua was 25 of 56 from the floor for 45 percent and 11 of 16 from the line for 69 percent. Tecumseh was 20 of 44 from the floor for 45 percent and 20 of 29 from the line for 69 percent. Both teams had 21 rebounds and Piqua had 12 turnovers to Tecumseh’s 18. Donovan Collins 1-4-7, Easton Lewis 8-11-33, Randy Collins 3-2-8, Braden Berner 2-0-5, Davey Berner 2-3-7, Drew Sarihan 0-0-0, Seth Hale 4-0-9. Totals: 20-20-69. Qurri Tucker 5-2-12, Kameron Darner 2-3-7, Trey Richmond 6-2-14, Mick Karn 7-2-19, Garrett Schrubb 3-2-10, Zach Tillman 1-0-2, Iverson Ventura 1-0-3, Riley Hill 0-0-0, Makeegan Kuhn 0-0-0, Zack Lavey 0-0-0. Totals: 25-11-67. 3-point field goals —- Tecumseh: Donovan Collins, Lewis (6), Braden Berner, Hale. Piqua: Karn (3), Schrubb (2). Records: Tecumseh 3-15, Piqua 6-12. Reserve score: Piqua 45, Tecumseh 42.